On 4th-6th March 2019, we organised an event on ‘Collaborations between Linguistics and the Professions’. If you missed it, here are three reports from early-career researchers – one for each day. The aim and focus of the Collaborations between Linguistics and the Professions event was to look at connections and opportunities that arise between the academic discipline of linguistics and wider industry. Broadly speaking, the event considered how university-based linguists may be able to advise in both the public and private sectors, providing consultancy to help inform real-world issues. As a PhD student applying corpus methods to the study of deceptive language, the first day of the three-day event was of particular interest to me, due to its focus on forensic linguistics and public engagement. After a quick welcome and opening of the event from Elena Semino, we started with a talk by Louise Mullany. Louise works at the University of Nottingham, but also carries out linguistic consultancy through the Linguistic Profiling for Professionals unit she directs. Louise discussed how her team has worked within a whole range of sectors and applied linguistic theory to help inform their practice. For example, politeness theory might well provide the answers to why one firm is struggling with their customer service; or perhaps an investigation into gendered talk might reveal some underlying problems or tensions. Perhaps even other methods could provide further insight, such as eye-tracking, or putting clients through an online learning course. Louise’s talk gave a good insight into how such a unit operates. The second talk built on the first one, with Isobelle Clarke showing us not only what you need to think about and be aware of, but also what you shouldn’t do when trying to build a reputation as a linguistic consultant. Although Isobelle has already had some good opportunities through the connections made throughout her PhD, she argued that her reputation will always be questioned for the stereotypes that come with the territory. For example: she is female, unlike most forensic linguistic consultants; she is from Essex, and therefore has an accent that is often prejudiced against; and she is also still early-career. These are things she cannot change, but still unfortunately affect whether or not she is considered credible as an expert in the field. It was good to hear such an open and frank discussion about inequalities within the field. Continuing with the forensic linguistics theme, Georgina Brown offered an insight into how new methodologies within forensic speech science are now being used to inform proceedings within the courtroom. Georgina introduced us to Soundscape Voice Evidence, a new start-up based right here in the Department of Linguistics and English Language at Lancaster, which is all the proof you need that there is a real appetite for further collaboration between academia and industry. Another interesting talk later that day was by Lancaster’s very own Claire Hardaker, who talked about learning when to say ‘no’ to opportunities that come your way. Claire discussed several cases where, due to her own excitement, she may have jumped into a new opportunity too quickly. As a PhD student, it was good to hear advice on how to handle different cases, and especially on how to be careful in picking which cases to pursue. Likewise, this seemed to be a common theme over the three days, with a whole range of attendees discussing issues they had encountered whilst carrying out this kind of collaborative work. The day came to a close with Tony McEnery’s talk discussing linguistics and the impact agenda. Tony reflected on some of his own experiences working with various agencies outside of academia, but the bulk of his talk concerned impact work against the backdrop of the REF. Tony gave some top tips for how to get your research out there and informing public life through the Civil Service, but also spoke very realistically about the priority it will be given by others. Everyone is busy – those in academia and those outside of it – and we must not lose sight of that. Tony finished with a call to arms: language pervades each and every aspect of our life, and it is clear that the discipline has a lot more to offer than it has traditionally done in the past. Day one of the Collaborations between Linguistics and the Professions event was enlightening. I, for one, never knew quite how much consultancy work linguists are involved with, and it was refreshing to see such a healthy appetite for it within the room – especially from early-career researchers, like myself, who may well do it in the future. 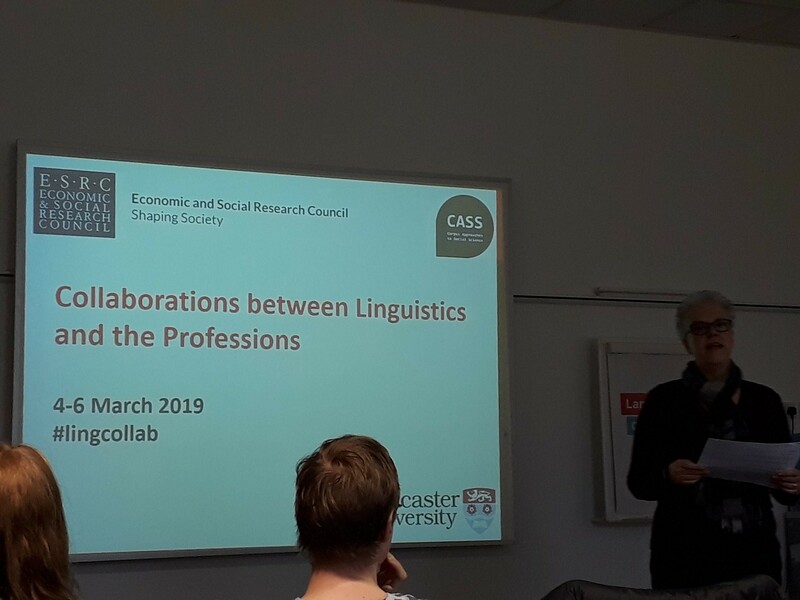 I attended the education focused sessions on Tuesday, given that my background is in English language teaching and, as a current ESRC doctoral student in Applied Linguistics, I was keen to find out more on collaborations between linguistics and the professions. The day started with a warm welcome from Elena Semino prior to the first presentation. Alison Mackey spoke about her work as a linguistics consultant in the private sector which ranged from educational technology companies to private schools in the USA. 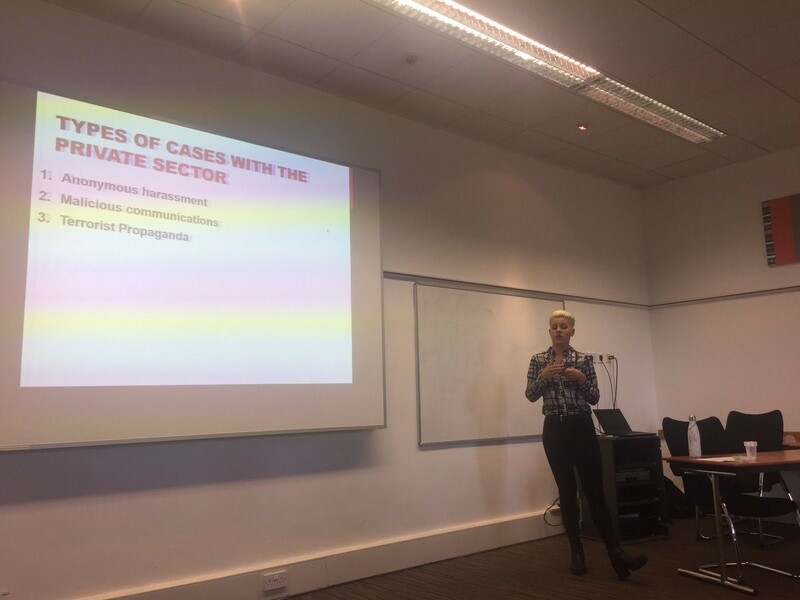 Alison gave lots of varied (and humorous) examples of the consultancy work and how she achieved these contracts, which she traced back to three key factors. These were networking and word of mouth referrals, the publication of a book on bilingualism by Harper Collins, and a Guardian article which has over 65,000 shares on Facebook. I was impressed by the range of Alison’s work activities, proving that linguistics can be widely applied to real-life practical contexts. One of the schools Alison has worked with in the USA, ‘Avenues: The World School’, was then represented by Abby Brody. The private school has an innovative approach to teaching as students are immersed in Spanish or Mandarin (alongside English) with the aim of becoming ‘truly fluent’. The links between linguistics and the school’s curriculum development over time were outlined. It was clear that the school was responsive to research and adapted their teaching and learning practices accordingly. 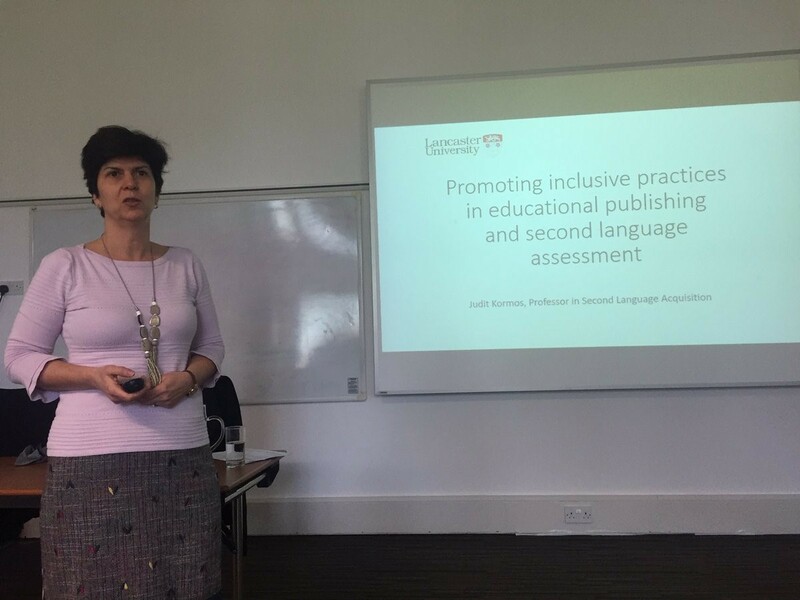 The next presentation by Judit Kormos was very inspiring in that the linguistics research has led to a direct impact on the way inclusive practices are promoted in educational publishing and second language assessment. Judit’s research on specific learning difficulties and L2 learning difficulties has aimed to give a voice and agency to those who are traditionally underrepresented. There were a number of examples given of working with publishers and government departments to develop strategies and ways of working which are inclusive. The success of Lancaster’s Future Learn MOOC on Dyslexia and Foreign Language Teaching was also discussed and there is now an opportunity to join the next launch of this MOOC on the 15th April 2019. Following a lovely long and well catered lunch break, we then heard from Claire Dembry of Cambridge University Press (CUP). Claire outlined the many opportunities for links between the publisher and academic research, including the recent Spoken British National Corpus 2014 (BNC) project in collaboration with Lancaster University. This project involved collecting 11.5 million words of spoken conversation and the BNC 2014 is now available online with free access. There are also opportunities to contribute to articles, books, research guides and white papers which are produced by CUP. Claire also answered questions on practical considerations such as contacting CUP, pitching ideas and negotiating fees, all of which was useful information to consider prior to any collaboration. We then heard from Vaclav Brezina about corpora and language teaching and learning. There were three main sections in the presentation – accessibility, research partnerships and interdisciplinarity. Accessibility covered the link between theoretical ideas of linguistics and the practical tools and techniques used in projects such as the BNCLab and #LancsBox. Research partnership highlighted the importance of collaboration with others such as CUP and Trinity College London. Finally, interdisciplinarity covered good practice guidelines on working with others including flexibility and collective ownership of goals. Cathy Taylor of Trinity College London presented about ‘The Spoken Learner Corpus’ (SLC) project collaboratively undertaken by Trinity College London and CASS, Lancaster University. This has involved collecting data from Trinity’s spoken Graded Examinations in Spoken English (GESE) at B1 level and above, leading to the creation of the SLC which can be explored for language teaching and research purposes. Cathy described the stages of the project including the rationale, the practical data collection of audio recorded exams from GESE and also the creation of teaching and learning materials based on the SLC. These materials are available on the Trinity website and cover topics such as managing hesitation and asking questions. This project is a great example of how corpus data can be used to inform and improve the classroom experience of English language learners. The final presentation was by John Pill, who spoke about his experience of updating the Occupational English Test (OET), an English language test for medical professionals. Collaboration between the test developers, language researchers and medical experts was outlined, including tensions between them in relation to the expected content, assessment criteria and outcomes of the OET. Overall, the process to create a relevant language test which covered English language and also practical medical aspects was successful with an updated test being launched following the collaboration. 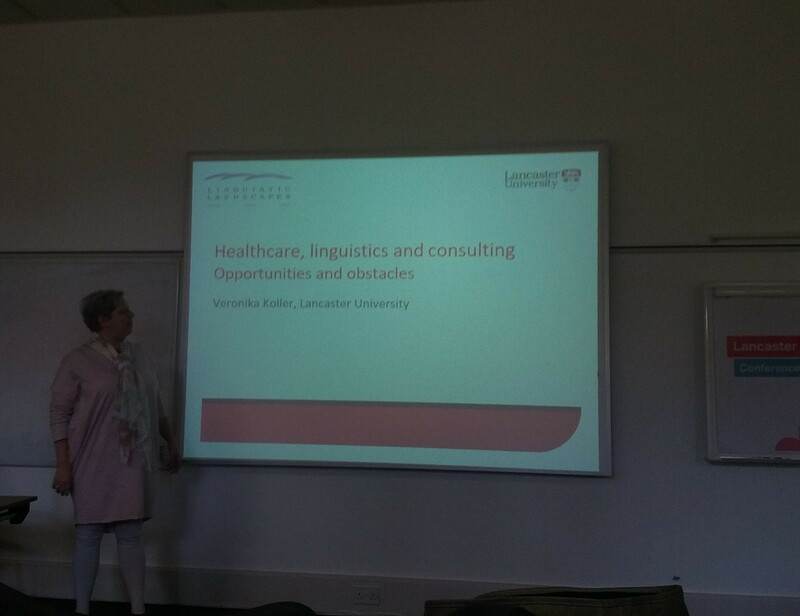 Each of the presentations linked the research within linguistics to applications in the wider education profession. There was a lot of useful information and plenty of food for thought for the audience in considering future collaboration activities. On we then go to hear Jeannette Littlemore from the University of Birmingham discuss her work with marketing and communications agencies on their use of figurative messaging. She focuses on the role of metaphor and metonymy for brand recognition, brand recall and consumer preference, drawing on examples from her research and work with the creative industry. Discussions following her talk continue into the lunch break, refreshed and well fed we move into an afternoon packed with insight from industry. Gill Ereaut brings in the perspective of a linguist working within the professions, introducing her consultancy Linguistic Landscapes. Their work includes evidence-based consulting for organisations on multiple levels, including organisational culture change. Another perspective from industry follows by Sandra Pickering from opento, who talks about the role of language in marketing. She provides a wide array of fascinating examples from her diverse experience with different organisations, and spends some time outlining how brands become metaphorical persons on their quest to build compelling brand narratives. The audience discusses some well-known brand narratives and archetypes of smaller and bigger players in the industry following her talk. Dan McIntyre and Hazel Price from the University of Huddersfield then present two very different case studies applying corpus linguistics in a private and a public setting with their consultancy Language Unlocked. The day ends with a Skype talk by Deborah Tannen from Georgetown University who captures the audience with her account on why and how she writes for non-academic audiences. Her multiple and diverse experiences of writing for the broader public make for interesting insights on the differences in writing for academics and writing for a lay audience. She emphasizes the value of having to find simple terminology for expressing and simplifying complicated ideas. Her talk was followed by a lively discussion, as were the others in the day. Exploring opportunities and challenges in linguistic consultancy work through discussing hands-on examples from different perspectives allowed highlighting recurrent themes too, such as the importance of considering ethical aspects in this process. It also showed the tremendous potential and relevance of linguistics for a variety of different aspects of the professional world. In sum, it was a fascinating day and a very inspiring conference overall – throughout the day it was evident that attendees genuinely felt the exchange between academics and practitioners applying linguistics in the professional world was very fruitful, and I am almost certain it is not the last we’ve heard of events such as this! It certainly broadened my own horizon as a PhD researcher looking at professional communication – showing many opportunities and highlighting the challenges to prepare for and navigate when seeking collaboration between linguistics and the professions. This entry was posted in Blogs, Events, Post Event Summaries, Research by admin. Bookmark the permalink.